For as long as humans have cultivated food crops, they have battled birds. The very earliest farmers devised ways of keeping birds from eating their crops, and the scarecrow was born. The first known scarecrows date to almost 5000 years ago. 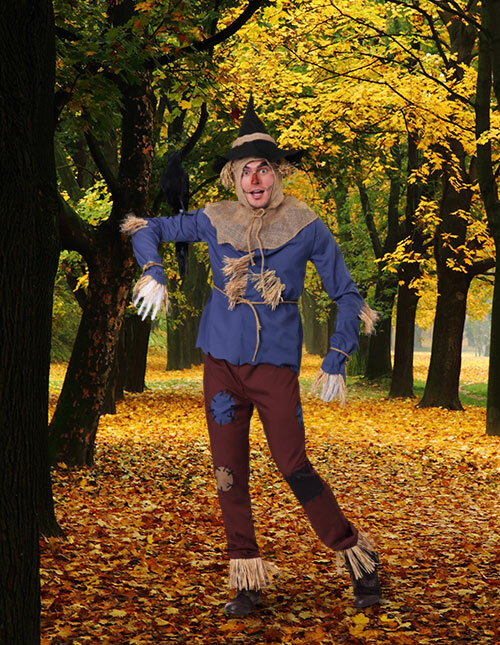 Many civilizations have used scarecrows or "bird-scarers." They include the ancient Egyptians, Greeks, Romans, Chinese, and Japanese. Native Americans used them before the time of Columbus. 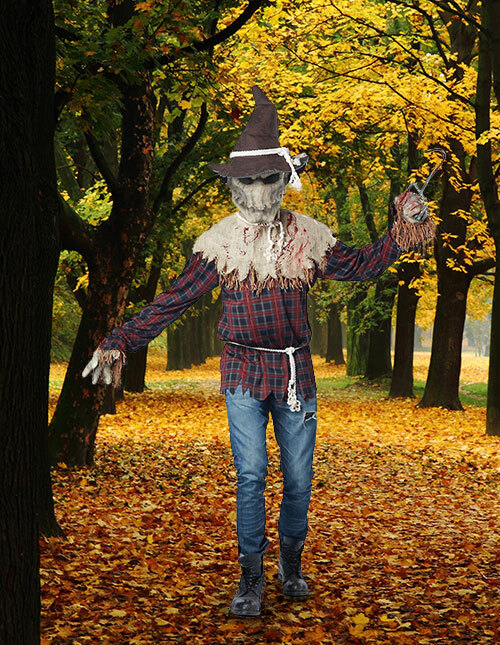 Most scarecrows have been quite similar over time and across cultures. They almost always resembled a human figure, dressed in old clothing of the time and stuffed with straw or hay. They have had many different names, in many different languages. Some English variations are hodmedod, murmet, hay-man, tattie bogal (or bogle), mommet, or mawkin. In Scots Gaelic they were bodach-rocais, meaning "old man of the rooks". In Wales, a scarecrow was a bwbach. Other names have included flay-crow, mawpin, mog, shay, guy, shuft, rook-scarer, kelson, and bebegig. A quick online search will give you names in other languages. Espantapájaros in Spanish. Kakashi in Japanese. Madáríjeszto in Hungarian. So, you can be a scarecrow from almost any era or locale. Create your own costume mashup. Start with a historic or ethnic costume, add our straw accessory, and you're set. Then look up the scarecrow name in the appropriate language. Scarecrows have figured in books, music, movies and comics. The oldest surviving book in Japan, from the year 712 AD, describes a scarecrow. And, of course, everyone is familiar with the Scarecrow from The Wizard of Oz, who went with Dorothy down the Yellow Brick Road. There are several different comic-book villains called Scarecrow. The best known is in the Batman Dark Knight movie trilogy. You can become any of them in one of our licensed costumes! 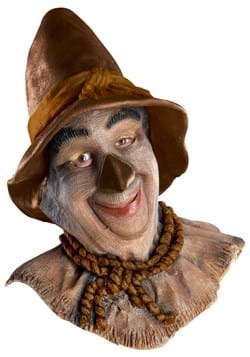 To be the Scarecrow from Oz, learn his signature song "If I Only Had A Brain." If you'd rather join Batman's rogue's gallery as an Arkham Asylum doctor, learn the names of some phobias. And practice speaking in nursery rhymes. 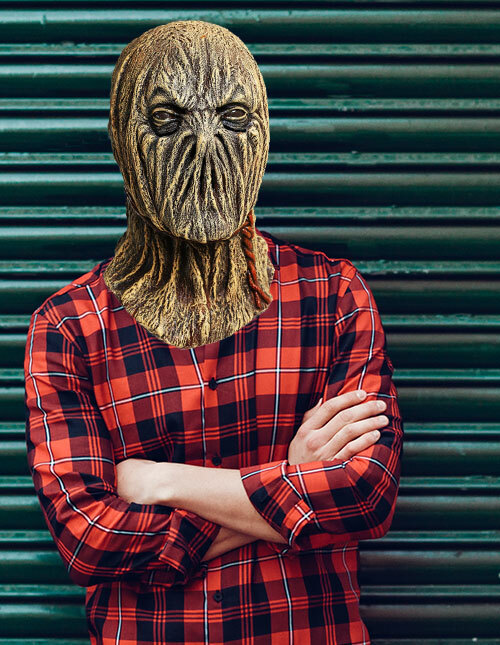 If you're going to dress as a tattie bogal, choose one of our many generic Scarecrow costumes. We have styles and sizes to fit anyone, adult or child, male or female. Then have fun with some of the different scarecrow names. 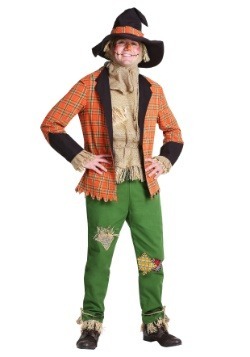 When your friends say, "Oh, you're a scarecrow," you can respond, "no, I'm not. I'm a hodmedod!" (or a mawkin, or a bwbach, or whichever name you like best). Fall is here! The sky is a bright blue against bright orange and yellow leaves. The hills are flowing with golden wheat. The apples are red and crisp. The bounty is ready to be harvested. And who do we have to thank for all these natural treats? Well, the scarecrow can definitely take a bow for all the work he’s done over the summer. Birds have been trying to snack on the wheat and fruit we worked so hard to grow through the months, but every time they get close the scarecrow blows in the wind, turning toward them with a painted-on smile. He might be made of rags but he’s certainly a diplomat. That’s a great way to deal with thieving birds if you ask us! 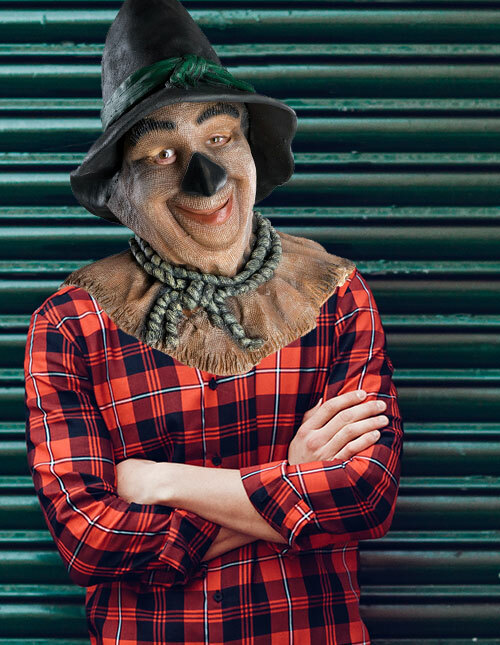 When you’re looking to the celebrate the harvest season, a nod to the scarecrow is a great way to go. 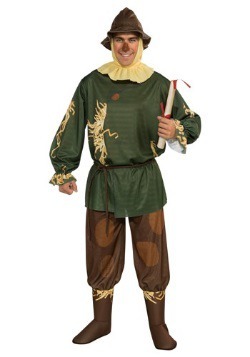 You’ll love our selection of costumes. 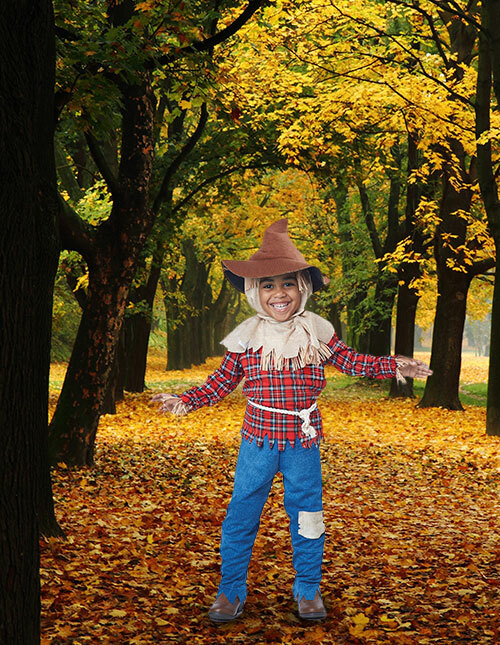 We’ve got the perfect scarecrow Halloween costumes for a spooky soiree, as well as several cheerful looks for any Harvest parades that you and the family might be walking in this year. 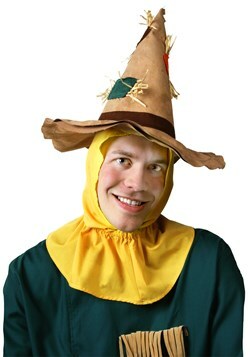 Maybe you’re even looking for a scarecrow Wizard of Oz costume to finish off a group ensemble! As we welcome winter and enjoy the last gorgeous days of fall while sipping on apple cider, there’s no better character to represent than the guy who worked all season to make that delicious feast possible. So, browse through these categories and check out all the options we have for festive fall looks- this is going to be good. Okay, okay. We might have been focusing more on the nice scarecrows out there in the opening paragraph. But they’re not all sunshine and flowers. There are so many great horror movies out there that show scarecrows coming to life in the fields, seeking vengeance for being abandoned in the sun for all those years. This page has spooky scarecrow looks to suit someone at every level of eerie interest. From your ghost story loving little girl to the Stephen King horror aficionado, you’re sure to remember the impact these scarecrow looks make! Oh boy, looks like this scarecrow has had it with the corn fields! We get it. A sentient scarecrow can only be so patient. But here’s the thing; we also don’t want this character tapping at our windows at night! 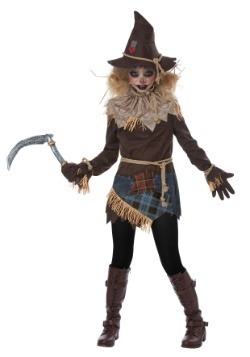 Not only does this scarecrow costume have a patched tunic, classic conical hat, and scythe, but it also comes with a booklet on how to create the model’s creepy makeup. So, make a classic entrance at that next costume party. Fall has been a long time coming! Talk about upping the ante! This scarecrow “has no chill”, as they say. The facial expression on this costume’s mask says it all. He’s mad. He’s got a scythe. If he sees one more crow in his field he’s going to flip! 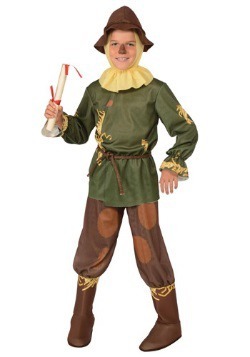 This boy’s scarecrow costume is the perfect way to get all your child’s buddies to shriek with fright at this year’s costume party. Trick-or-treating is all about embracing the excitement of fall. Neighbors will love seeing your kiddo get into the holiday spirit. So, get ready to invite some spooky to your Halloween this year. 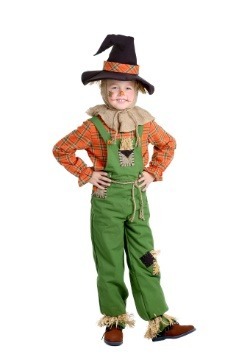 Your child is sure to love our scarecrow Halloween costumes this year! 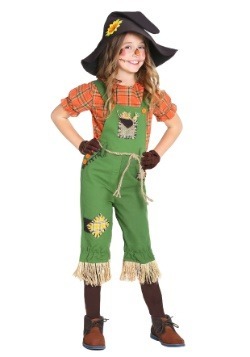 Your little girl can become a harvest nightmare in this wicked patched costume. 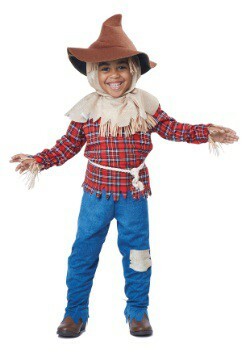 This girl’s scarecrow costume has a layered look with a wide, ragged collar, a patched tunic and a conical hat. The hems are accented with straw and there are ropes around the waist, wrists, and hat making your child look like she’s stuffed with straw. The scythe and a makeup instruction booklet are also included so you can be sure your child is ready to celebrate the holiday. This look makes us feel super creepy. While the other scarecrows might have a temper, this scarecrow costume has some serious teeth- some seriously incriminating teeth! The mask is long, covering your shoulders so that your humanity doesn’t shine through. There is straw under the burlap, accenting the plaid just perfectly. The ensemble is topped with a classic conical hat but we’re not fooled. We wouldn’t touch this ghoul with a ten-foot pole! Whether you’re putting on a play or you want to do a Wizard of Oz group costume, skip down the blocks of your neighborhood on Halloween night like it’s the yellow brick road. 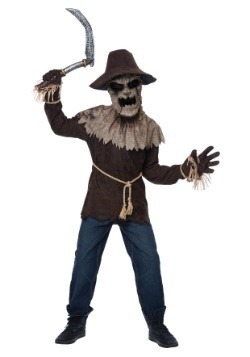 An Oz group costume requires a Scarecrow costume and we have the costumes for you! 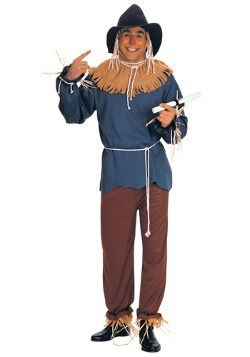 Unlike our Halloween Scarecrow costumes, these scarecrow costumes are cheerful and dopey. All these costumed characters only want a brain- a decent enough request! 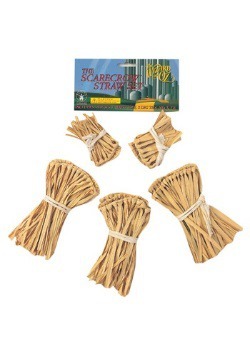 So, keep it happy and light with these scarecrow selections. All you need now is a tin man, a lion, and a Dorothy to make your group complete! Is it just us or does this scarecrow seem a little friendly with the birds? We get it, even if scare is in your name. Acting spooky gets a little old after a while. But this guy seems more fashionable than the rest of the scare crows on our list. 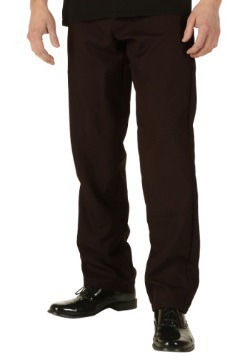 The straight cut pants are trimmed with straw as well as the shoulders, sleeve hems, and hat. The burlap has a loose weave to make sure your ears can breathe as you bond with the birds. 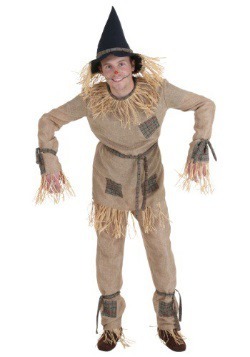 So go ahead and pick up this cheerful scarecrow costume; maybe you’ll even make some new friends with a lion, tin man, and a little girl in a gingham dress. 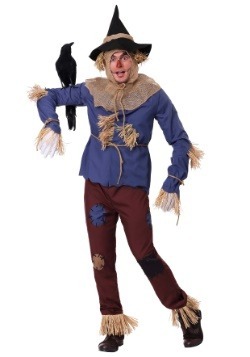 Want the perfect scarecrow costume to wear to a daytime Halloween event? 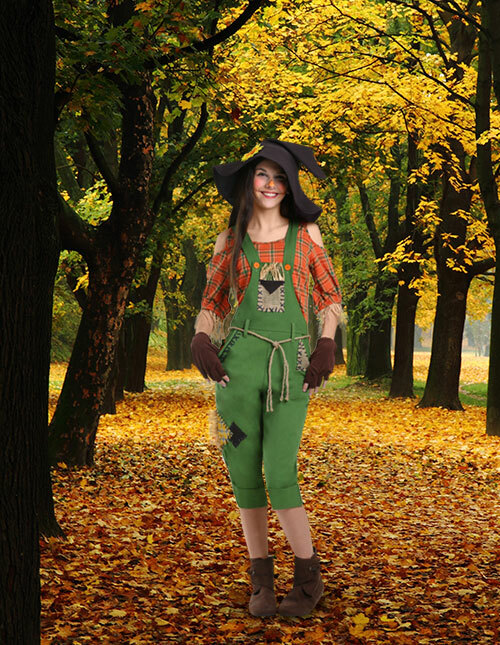 You’ll feel awesome in the green cuffed overalls with a cold shoulder plaid shirt underneath. 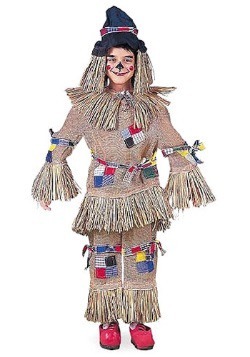 This unique woman’s scarecrow costume is sure to make you feel like you’re on top of any autumn festival event. People are sure to assume that you know where the apple bobbing contest takes place and where to get the best apple cider. 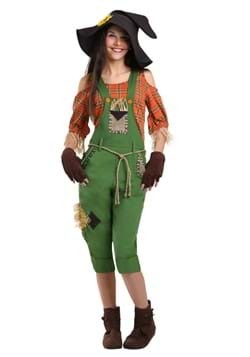 You’ll look like the trendiest queen of fall in this scarecrow Halloween costume! Did you see the adorable costume above? This sweet girl’s look will make a different kind of scarecrow couples costume- a mommy and me costume! 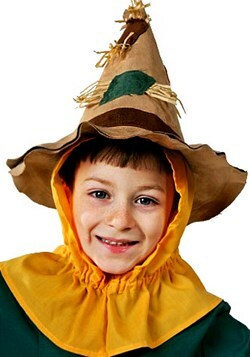 The overall scarecrow costume has a sweet skirt with plenty of patches and a puffed orange shirt underneath the straps. The look is topped off with patches as well as a jaunty little sunflower as well as burlap colored socks and a straw-trimmed skirt. 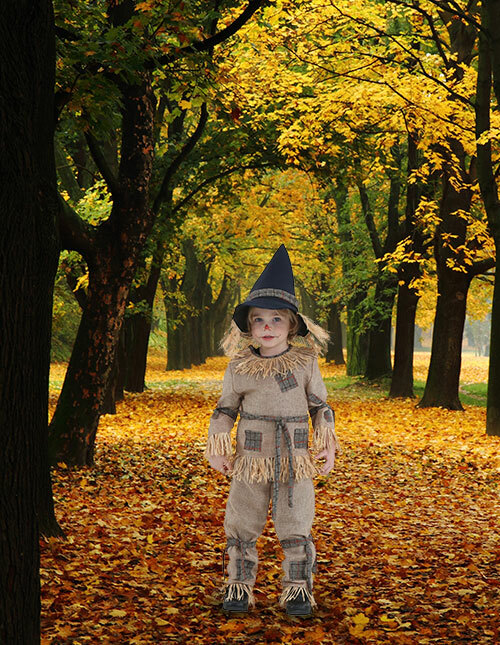 This girl’s scarecrow costume will be the perfect touch for any fall party. Your kiddo is always trying to learn more and more. It can be frustrating to be so young. How is your kid supposed to stuff all this new information into their brains? 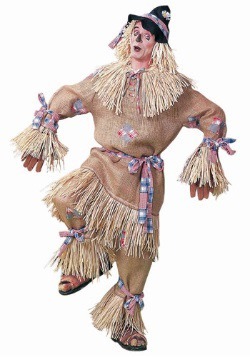 Your child can connect with the Scarecrow character’s struggle when he or she watches The Wizard of Oz. Just like the character from this classic story, you know your child has had the brains the whole time. But your kiddo is still on the road to get some serious smarts. 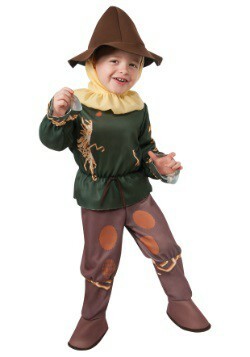 Your little one will fit into the role of Scarecrow absolutely perfectly! 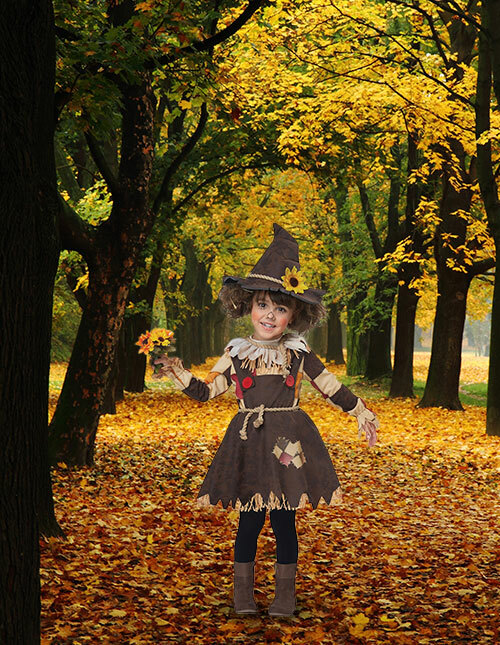 Keep it cute with this toddler scarecrow costume and the family will be ready to embark on their colorful quest in no time! Is baby’s first fall already here? 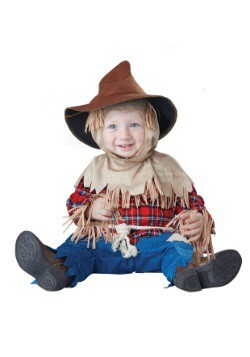 There are few costumes as timeless as dressing your little one as a scarecrow! We can almost see that Halloween photoshoot now! 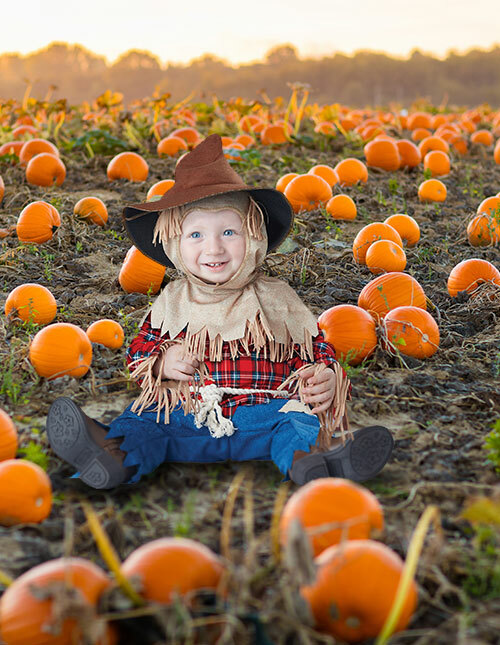 A haybale backdrop and plump mini pumpkins with your scarecrow baby propped up in the middle makes a great post on Instagram or Twitter. It won’t be long before your kiddo gets to decide what to dress up as for Halloween. Our advice? Get those perfect fall photos in before your child starts demanding to dress up as a poop emoji years from now. Apple picking will never be the same. Sure, it was fun before but folks at your local apple orchard will be so busy “oohing” and “awwing” over your little scarecrow that they’ll let their hot apple cider go cold! This little guy is both comfortable and adorable with a hood that fastens in the back so you don’t have to struggle to get it over your wiggly baby’s head. 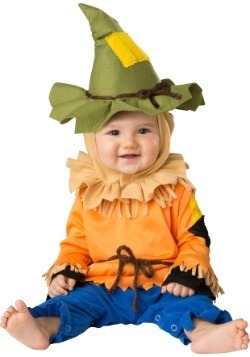 The shirt also has a hook and loop fastener in the back and the pants are elastic which makes this baby scarecrow costume perfect. Because, as we know when it comes to kids, keeping them happy is all about comfort! Man, can you believe kids these days? How dare they flaunt their cuteness like this! Back in our day our parents simply dressed us up in burlap and told people that we were sack of potatoes for Halloween. Sure, it was itchy but they didn’t have this site to browse through now, did they? Thank goodness for the internet. 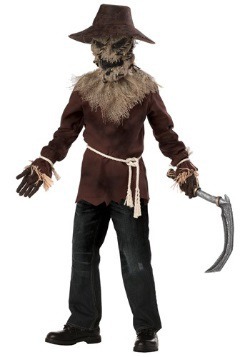 This scarecrow outfit couldn’t be more convenient for Halloween night. The pants snap open to make diaper changes quick and the hood is nice and soft to make dozing during any Halloween celebrations a breeze! Your children will probably be working on all sorts of fall projects at school. Those rounded scissors will be cutting out pumpkins and skeletons once late October rolls around. So, it makes sense that the idea of dressing as the mascot of autumn is pretty exciting to these kiddos. 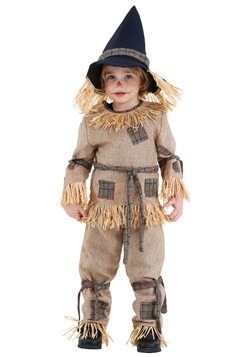 Your child will look timeless and picturesque in these scarecrow costumes. 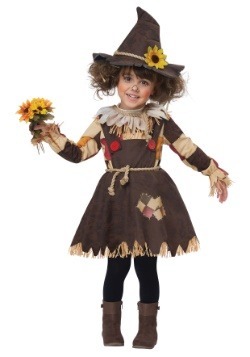 Our scarecrow costumes for girls have gorgeous sunflower accents and happy colors, far from the spooky scarecrows that are featured elsewhere. 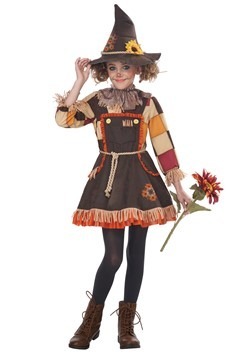 This sweet pumpkin patch scarecrow costume has a full, bouncy skirt. 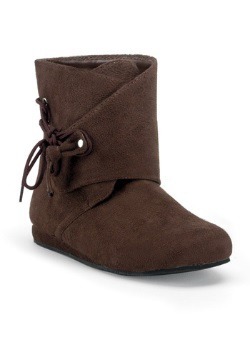 The brown fabric has an adorable straw trim and patches throughout. 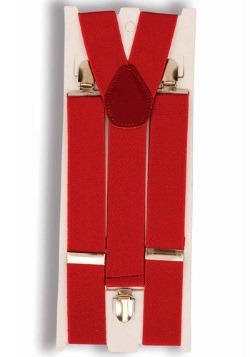 The collar has straw detailing as well as a rope on the collar and waist. The ensemble is topped off with a conical hat that’s accented with a sunflower. 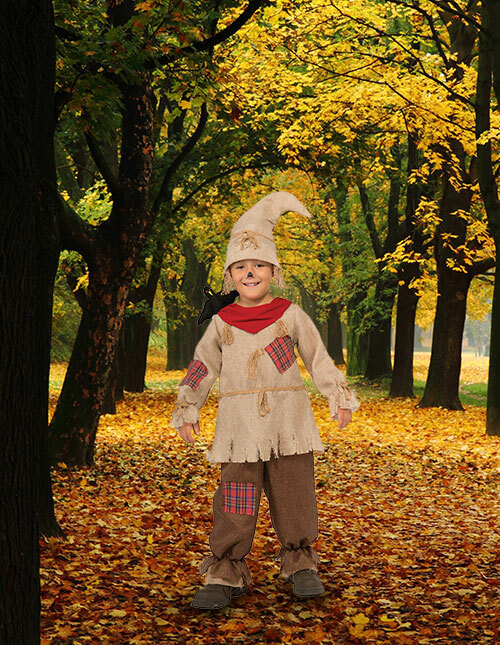 Your child will look sweet in this burlap scarecrow costume with plaid patches as well as straw along the hems along the neck, sleeves, and pant legs. Your child will look completely timeless while he snacks on a caramel apple. You’ll have a hard time limiting your social media posts. Although, we’d say most people would definitely not mind getting photos of this adorable scarecrow in their social feed! Are you looking for a bright costume that will stand out in the gloomiest autumn weather this year? Your child deserves a look that’s as happy as their personality. 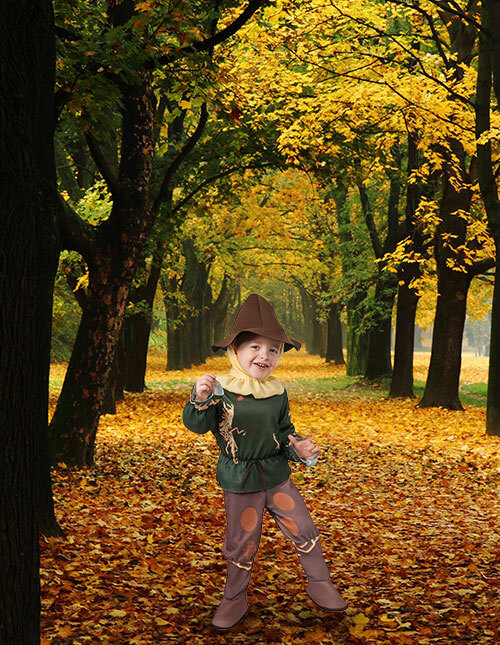 The burlap printed hood is nice and smooth, allowing your child to remain comfortable while trick-or-treating. The bright, raggedy plaid shirt is sure to stand out in the grays, blacks, and whites of Halloween parties. 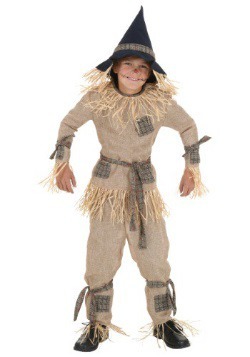 It might be Halloween but your happy kid can still be his or her cheery self when dressed in this harvest scarecrow costume! 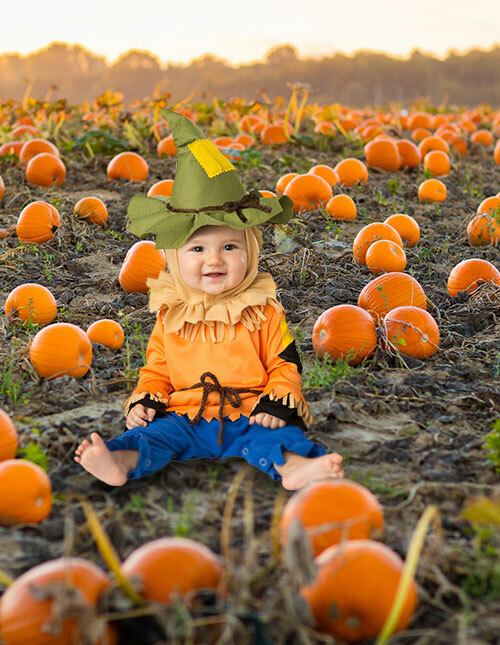 It’s time those standard baby scarecrow costumes grew up! 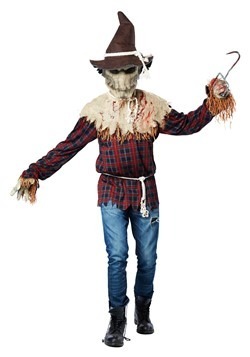 This scarecrow costume has a truly unique look. It looks like we dug this look out of an antique shop. The burlap look is textured, but soft. There are plaid patches throughout. A rope accents the wrists and waist. Your autumnal scarecrow child will be able to layer up on chilly Halloween nights as the jumpsuit is a little oversized. A crow is fastened to the shoulder to add extra character. The whole thing is topped off with a tall, cocked hat with straw along the bottom. You’ve got your props ready. You’ve got a pitchfork or a scythe to make sure everyone knows about your character’s career path. 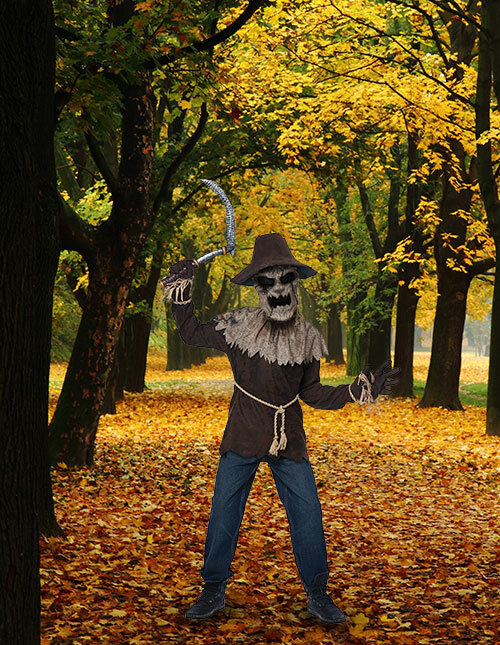 You’ve been taking in the countryside, ready to channel the scarecrow you’ve got waiting inside. You’ve even found the perfect over-sized raggedy plaid shirt. Now Halloween is coming around. 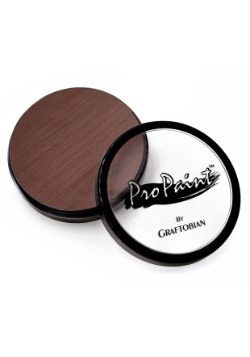 You’ll be ready to head out into the public eye as the quintessential autumn character. Now, whether you go spooky or sweet is up to you! This is the only scarecrow on the list that’s straight out of 1930’s Hollywood. This officially licensed latex mask slides over your head with a slit down the back. He’s got a happy smirk on his face. 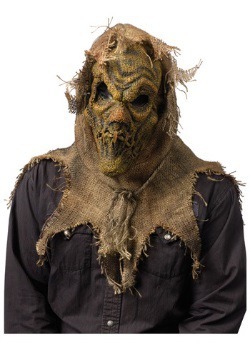 The mask will make you look as innocent as the scarecrow in the movie. This is a great mask for Wizard of Oz parties as well as group costumes. Just be sure you stay far, far away from matches. This character is patient but messing around with fire is really the last straw. Want to combine your DIY scarecrow costume with a super unsettling mask? 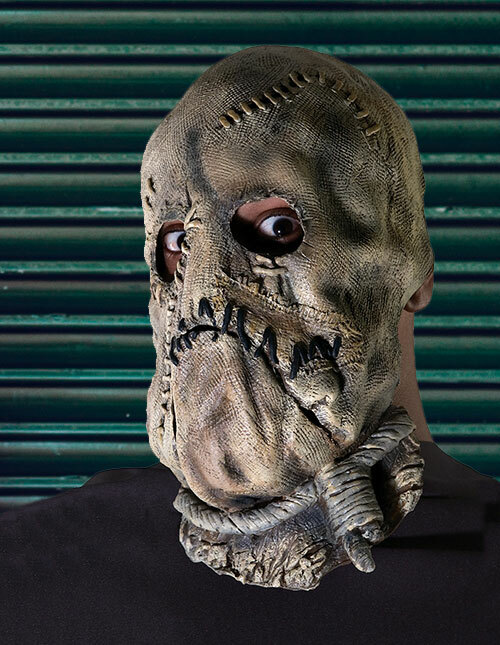 You’ll love how nightmarish this latex scarecrow mask will make you feel! All you need is an over-sized plaid shirt and a farmer’s cap to make it look like you’re a creature from a countryside cursed crop, come to seek revenge. There’s a slit in the back to make slipping this mask on simple. It’s quality enough to throw on for a Fright Night fundraiser and flexible enough to be stored away for next year’s Halloween bash! You know what they say about psychologists … when it comes to mental health, they’ve got it together. Take Scarecrow from Batman Begins, for instance. He’s got some groundbreaking ideas when it comes to clearing the psyche. 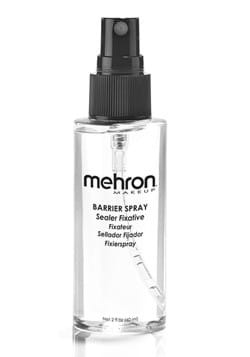 That fear inducing toxic gas he sprays people with is revolutionary… in the worst way but revolutionary all the same! 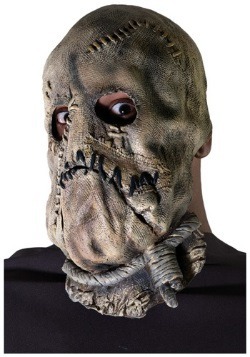 Transform into The Scarecrow, one of the best Batman villains in Gotham’s history with this detailed vinyl mask. Poor Bubba, he’s not a true scarecrow really. He’s just misunderstood. And he’s out to get revenge for all that misunderstanding. 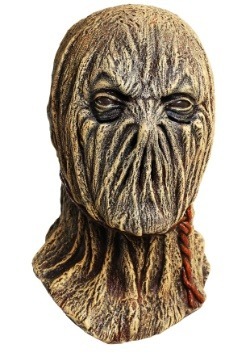 This mask is one for true classic horror fans. 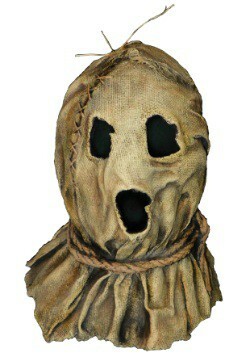 It looks just like a burlap sack with a ragged looking ropes, threads, and unkempt hems around the eyes and the mouth. 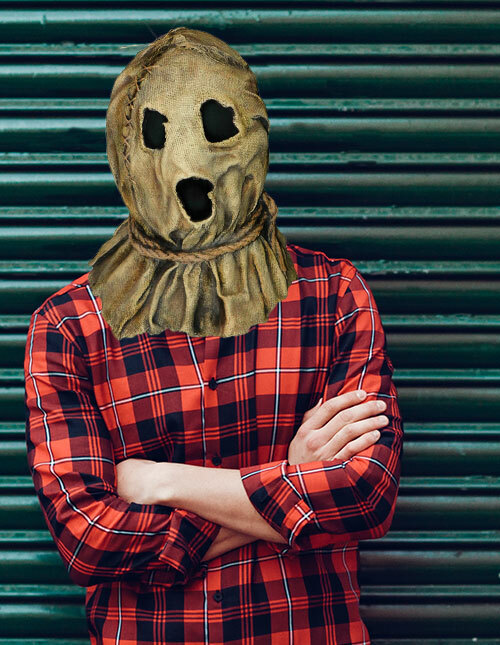 Pair the Bubba scarecrow mask with an oversized blue coat, jeans and an old farm shirt. 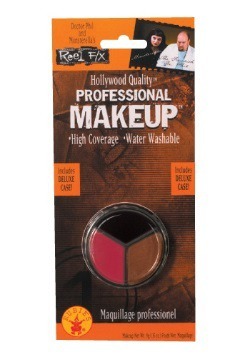 Any classic eighties movie fans are sure to love this costume. It’s about time that Bubba gets set free on the night once again!